I’ve previously covered topics such as the most wheelchair accessible cities in Europe, the best accessible boat tours in Europe and the top 5 accessible must-see views in Europe. In this month’s newsletter, it is time to cover one of my most treasured things about Europe – the many old, historic, world-class museums. Whether you’re looking to discover the first fossils or contemporary art, each of these spectacular museums are a great contribution to the history of our civilization and provides a whole new dimension to exploring Europe firsthand. I’ve had to opportunity to personally visit and inspect dozens of museums in Europe in my wheelchair. I feel confident that these 4 most impressive accessible museums in Europe are among the most enjoyable, accessible worldwide. Do not make the mistake of leaving them out when planning your 2018 accessible European holiday! It is only right to start with the world’s largest and most visited museum, the Louvre! With close to 10 million visitors each year, this central Paris landmark located on the Right Bank of the Seine houses approximately 35,000 objects from prehistory to the 21st century. From the wheelchair friendly surrounding area with curb cuts in most places, to a flat main entrance and elevators to reach the exhibition levels, the Louvre provides great accessibility. Approximately 95% of the museum is fully accessible, using 18 elevators and 20 wheelchair lifts. The museum is housed in an old palace, and finding the most accessible routes without steps can be challenging.The best way to make the most of your time here, without getting exhausted and lost in the exhibition halls, is to book a private accessible tour with a guide specialized in navigating the museum with wheelchair users. 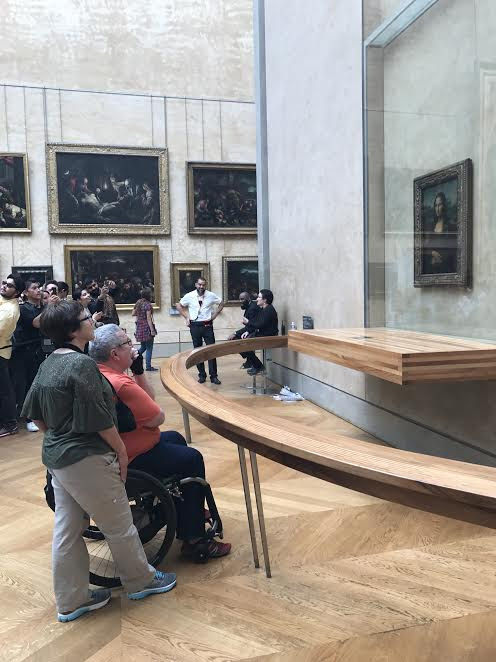 Disabled visitors can usually skip the long lines to enter, and will have priority access to get up close to the Mona Lisa (if escorted by a tour guide or museum staff member). Not many museums can legitimately be described as one of the best museums in the world… however, this is one of them! Greece, Egypt, the Middle East, the Far East, and the Americas…. It’s all here! Overall, the British Museum offers excellent accessibility features including easy access entrances, fully accessible restrooms and smooth and spacious display areas. The main entrance in the front (south of the building) has 12 steps but a wheelchair lift has conveniently been installed to the side of them. The entrance in the back (north of the building) is level access. Approximately 95% of the museum is wheelchair accessible using various elevators. Note that Galleries 6 and 33b have steps. With an immense artistic legacy, the Uffizi Gallery is one of the most recognized museums in the world – a true haven for anyone who loves art and history. The Museum is home to over 1600 paintings spread throughout more than 60 rooms and hallways, and features masterpieces such as Boticelli’s Primavera, Davinci’s Annunciation, and Michelangel’s DoniTondo. While the museum offers good accessibility including large open spaces with smooth surfaces and accessible restrooms, disabled tourists will need to have someone pickup their tickets on the west side of the courtyard (there are steps to get to it) and wait for them by the ramp on the northeast corner of the courtyard, closest end to the Palazzo Vecchio. Generally, the Uffizi Gallery offers free admission to disabled guests and one companion. When you make your reservation be sure to mention that you are disabled. Founded by Pope Julius in the early 16th century, the Vatican Museums boast one of the world’s greatest art collections (approximately 7 km of exhibition halls and corridors). While you can find anything from Egyptian mummies to modern paintings here, the highlights of the museums include the spectacular collection of classical statuary in the Museo Pio-Clemtino, the Raphael Rooms and the breathtaking Michelangelo- painted Sistine Chapel. 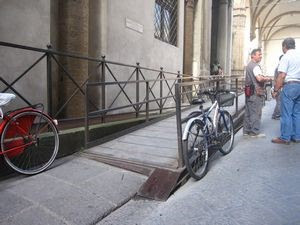 The Vatican Museums site provides very good disabled access throughout, although the most direct path to Saint Peter’s Basilica involves a flight of stairs. There is step-free access in most areas, using elevators and wheelchair lifts to avoid the stairs. Additionally, the floors are generally smooth and easy to navigate, and the ramps have similar slope as those required by US and UK accessibility standards. 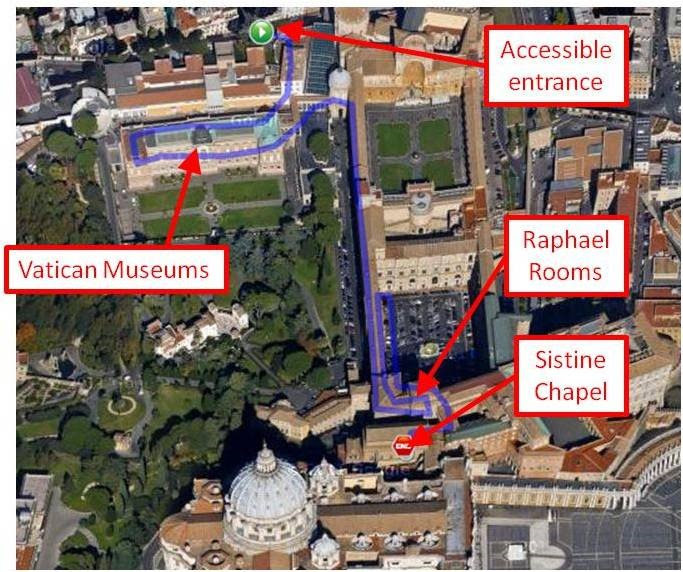 Accessible route from entrance through Vatican Museums and Raphael Rooms to Sistine Chapel (total route to the Sistine Chapel and back to the entrance is 1.0 mile or 1.6 km). The Vasa Museum, Stockholm – see the 1628 warship, Vasa and many of its historic artifacts. The Swiss National Museum, Zurich – one of the most important museums of cultural history in Europe. The Rijksmuseum, Amsterdam – the Dutch national museum dedicated to arts and history in Amsterdam. Located in walking/strolling distance from another must-visit museum, the Van Gogh. The Prado Museum, Madrid – the Spanish national art museum, widely considered to have one of the world’s finest collections of European art, dating back to the 12th century! The New Acropolis Museum, Athens – one of the most high profile museums built in Europe in the 21st century. It holds archaeological treasures of the Acropolis of Athens. The Jewish Museum, Berlin – exhibits the social, political and cultural history of the Jews in Germany from the fourth century to the present, representing and integrating the repercussions of the Holocaust. The Accademia Gallery, Florence – While the Uffizi Gallery generally has more to see, this museum is particularly popular as it is the home of Michelangelo’s sculpture David. Contact us to learn more about how we can include any of these spectacular museums in your 2018 Accessible European Holiday! We only have ONE accessible cabin left on each of our 2018 Accessible Group Cruises! One for the 2018 Accessible Mediterranean Cruise and one for our 2018 Accessible Baltic Cruise! Fully-accessible shore excursions are included in every port. Book now to claim the last spots!